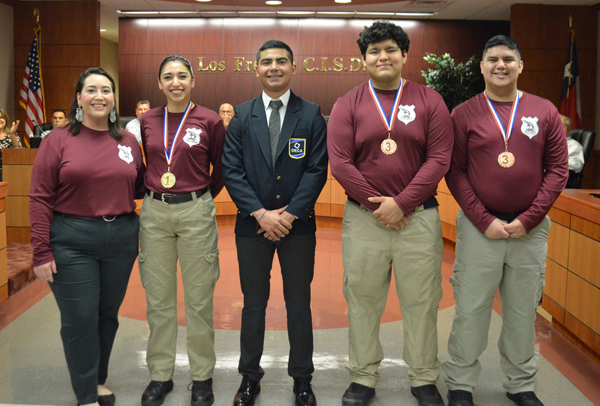 Ten Los Fresnos High School students have qualified to compete at the Texas Public Service Association state conference March 28-29 at the Brazos County Expo Complex in Bryan. The mission of the Texas Public Service Association is to promote law, public safety, corrections, and security. Students gain knowledge, skills, leadership, and student growth through real world career preparation, experience, training and competitive opportunities. Students will be competing in one or more of the events include Daniel Banuelos, Aaliya Cruz, Stephany Errisuriz, Jacob Garcia, Britney Garza, Robert Heredia, Brianna Larrasquitu, David Maya, Desyree Salas and Sarah Silva. Law enforcement: 911 Call Taking, Agility Course, Building Search, Crash Investigation, Disturbance Call, Felony Traffic Stop, Foot Pursuit, Report Writing, Special Weapons and Tactics (SWAT) and Traffic Stop. The awards ceremony will be held at 3:30 p.m. on the final day of the conference.